One of the most famous and important art cities in Italy is Florence in Tuscany, visited every year by thousands of tourists from all around the world. During the 15th and 16th centuries it was well-known in Europe as the “cradle of the Renaissance” because it marked the history of Italian culture and art under the Medici dynasty. 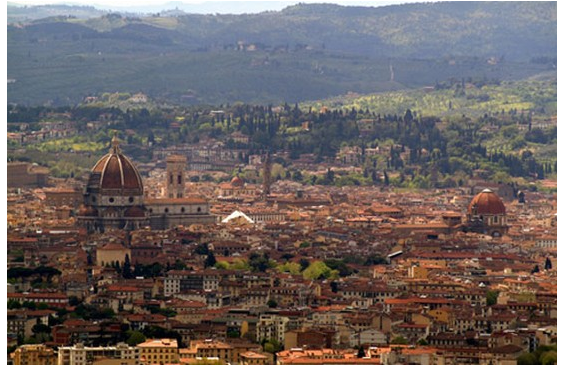 Since 1865 to 1872 Florence was the capital of the Italian reign, later to be replaced by Rome. One of the Tuscan dialects, the Florentine is very similar to modern Italian for its vocabulary and pronunciation. You can find this dialect – known as “vernacular” – in the masterpieces of the Florentine poets Dante (Divine Comedy), Petrarch (Canzoniere) and Boccaccio (Decameron). Many important Italian painters have lived in this city; we will name just a few: Cimabue, Brunelleschi and Giotto who created the famous Campanile. There are a lot of important architectural works such as the baptistery of san Giovanni, the domed cathedral of Santa Maria del Fiore and the Uffizi Gallery. If you like to walk you can go along the Arno river on the Ponte Vecchio which is famous for its historical shops and workshops. Rinascimento: Renaissance. This period symbolizes the transition between the medieval and the modern times expecially for art and literature.